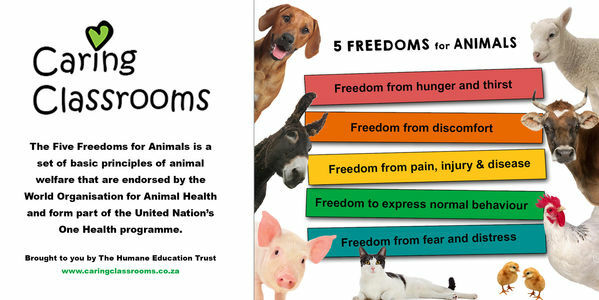 Please include the Five Freedoms for Animals in the Foundation Phase Curriculum for South African learners as an essential component in the development of integrity, ethics and empathy. The Five Freedoms for Animals must become a basic learning requirement for all young learners, along with their 123's and ABC's. Social scientists around the world suggest that loss of empathy is at the root of our troubled and violent world. Cambridge University's Professor of Developmental Psychopathology Simon Baron-Cohen puts it this way: "The critical role of empathy in our society has been overlooked. Empathy is the most valuable social resource in our world and the erosion of empathy is a critical global issue of our time. Empathy must be put back on the agenda. We need to realise what a powerful resource we have at our very fingertips, if only we prioritize it." The building blocks of empathy are rooted in how we are taught to treat those who are at our mercy – the animals. The Constitutional Court noted this fact in 2016 when Justice Sisi Khampepe, speaking on behalf of a full bench, stated: "Animal protection safeguards the moral status of humans and the degeneration of human values." We must not think that learners in the Foundation Phase are too young to understand the Five Freedoms. Watch this class of nine-year-olds presenting the Five Freedoms Dog Puppet Show with full understanding of the issues. Most importantly, a follow-up survey showed that the learners spontaneously extended their understanding of the Five Freedoms to all animals.